Filmmaker Jonathan Demme – best known for Stop Making Sense, The Silence of the Lambs, and Philadelphia­ – was originally lured to Austin by one incredible mixtape. In late 1980, filmmaker Ted Bafaloukos returned to New York from opening his reggae film Rockers in Austin. 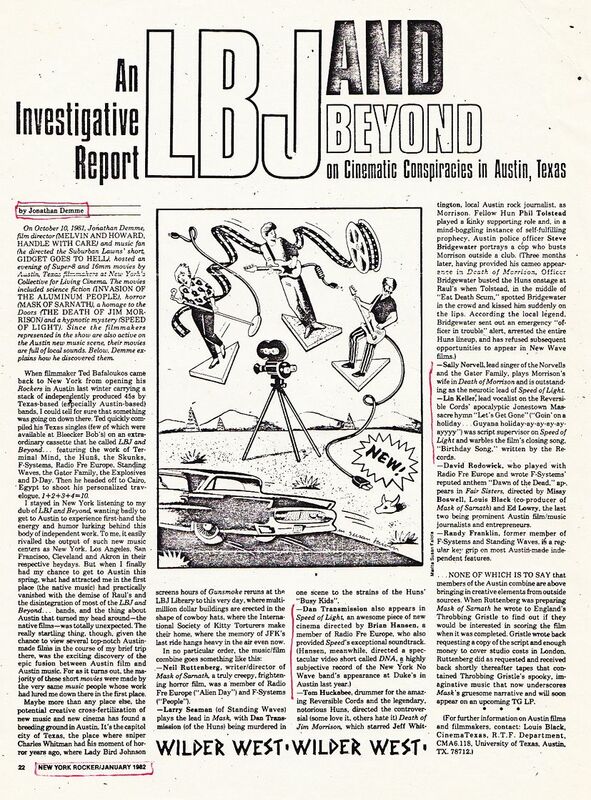 He’d brought back with him a stack of 45s by Austin bands, and compiled the songs on a cassette he titled “LBJ and Beyond… .” Demme got a copy of this tape and was floored by the music of Terminal Mind, the Skunks, the Huns, Standing Waves, F-Systems, Radio Free Europe, the Big Boys, the Boy Problems, the Re-Cords, D-Day and others. He explained in a 1982 New York Rocker article that, after hearing that music, he “wanted badly to get to Austin to experience first-hand the energy and humor lurking behind this body of independent work.” So he called up CinemaTexas, the graduate student-run film society at UT, whose staff were big fans and had sent him articles they’d written about his films. He talked with Louis Black about the local music scene, and about visiting. When Demme came down in ‘81, he was disappointed to find that Austin’s main punk/new-wave venue, Raul’s, had recently closed, and that some of the groups he’d heard had disbanded. But he was excited to find a D.I.Y. film scene in Austin that reflected the same spirit. Louis Black (future co-founder of The Austin Chronicle and SXSW) gathered a bunch of locally made Super 8 and 16mm films to show Demme while he was visiting, and many of them happen to have been made by musicians that were on that mixtape. “The really startling thing,” Demme said, “was the exciting discovery of the epic fusion between Austin film and Austin music… . Maybe more than any place else, the potential creative cross-fertilization of new music and new cinema has found a breeding ground in Austin.” Before he left town, he’d already arranged for a program of these films, “Made in Texas, New Films From Austin,” to be shown as the fall season opener at the Collective for Living Cinema in New York. In a time when regional underground filmmaking had few outlets, Demme brought Austin’s unique brand of indie experimentalism to audiences in New York and elsewhere. These unique, rarely-seen films have now been restored, and the reassembled “Made In Texas” program is being presented for the first time in over 30 years. Louis Black, Jonathan Demme and Richard Linklater introduced the premiere screening of the restored program at SXSW this spring, with many of the filmmakers and musicians in attendance. Louis Black will be introducing an upcoming screening of the program at the Museum of Fine Arts Houston, co-presented by SWAMP, on Saturday, September 19th. Having close, decades-long relationships with the films, their makers, and the ever-evolving Austin film scene, Black is sure to have some great insights. The context of these pieces of shrapnel coming from the middle of Austin’s heyday of D.I.Y. music, film, poster and zine experimentation in the late-’70s/early-’80s is fascinating. That Raul’s-era renaissance is an inspiring history, and too often overlooked outside of certain local circles. And the background story of chance encounters that brought these little regional flicks to inspire Demme, Linklater, and countless others outside of the Austin scene (in an era not only before the internet but even before widespread use of VHS tapes) seems kind of miraculous. But what’s most important and exciting here are the films themselves. This resurfaced collection of sonically charged experimental-narrative films mixes moments of amateur clunk, unclassifiable brilliance, and certifiable insanity – all with a great energy and a distinctly Texan sensibility. Two real stand-outs for me are Brian Hanson’s Speed Of Light and David Boone’s Invasion of the Aluminum People, which bookend the program. The longest of the six short films included, these two were favorites of Demme’s; he became friends with both filmmakers and even included brief bits of both films in his 1986 comedy Something Wild. These were also the two that made a big impression on Linklater. Shot on 16mm color film, Speed of Light is an odd, hypnotic ’60s period piece that makes references to JFK and early NASA space missions as a young woman and her daughter drive a red convertible into unknown territory – geographic and psychological. The filmmakers described it well as “a screaming red piece of time crashlanding in the cultural backwash of the American Gothic.” Its great soundtrack of synth drones, guitar loops, and sound collage is by the band Radio Free Europe, of which the film’s director, Brian Hanson, was a member. Shot on black-and-white Super 8 film, Invasion of the Aluminum People is a frantic and surreal send-up of 1950s Sci-Fi movies, inspired by the newly formed Dallas-based Church of The Sub-Genius who prophesized the end of the world and condemned the conspiracy against our freedom to “SLACK OFF.” Mankind is under attack in David Boone’s impressive paranoid fever dream of mannequins, TV commercials, and aluminum foil-covered creatures. Death of a Rock Star is a well-photographed, relentlessly fast-paced montage of rock-and-roll debauchery and destruction, loosely based on the life of The Doors singer, Jim Morrison. It’s directed by Tom Huckabee, drummer of the Huns, and stars Austin music critic Jeff Whittington as Morrison. A bit of weird trivia here is that Austin police officer Steve Bridgewater appears in the film portraying a cop who busts Morrison outside a club, and a few months later it was Bridgewater that busted the Huns onstage in the legendary, nationally publicized Raul’s raid. The program also includes Mask of Sarnath, a creepy horror short written and directed by Neil Ruttenberg and featuring an original score by Throbbing Gristle; the robbery movie Fair Sisters directed by Louis Black, Missy Boswekll, and Ed Lowry; and a nice Buster Keaton-style silent comedy, Leonardo Jr., made by and starring Lorrie O’Shatz.